VIEWING BY APPOINTMENT ONLY. SIMPLY STUNNING CAR WITH ONLY 1 FORMER KEEPER SINCE NEW. MASSIVE SPEC CAR ( OVER £18000 OF ADDITIONAL SPEC ) WITH 22" ALLOY WHEELS, FULL LENGTH OPENING PANORAMIC ROOF, HEADS UP DISPLAY, DUAL VIEW TV, REAR SEAT ENTERTAINMENT WITH 3 SETS OF WIRELESS HEADPHONES, VOICE ACTIVATION, NIGHT HEATER WITH REMOTE CONTROL, HEATED AND COOLED SEATS, MASSAGE SEATS, MEMORY SEATS, FULL 360 DEGREE CAMERAS, LANE DEPARTURE, ADAPTIVE CRUISE WITH FORWARD ALERT, DEPLOYABLE TOW BAR. KEYLESS ENTRY. STOP START GIVING LOWER CO2 AND CHEAPER ROAD TAX. THIS CAR IS FINISHED IN CELESTIAL BLACK WITH IVORY LEATHER TRIM AND FULL BLACK PACK, GLOSS BLACK WHEELS WITH ALL MATCHING TYRES. THIS CAR HAS TOO MUCH SPEC TO LIST PLEASE CALL TO GET FULL SPEC. TWO KEYS, FULL BOOK PACK. UP TO 2 YEARS WARRANTY. STUNNING 1 OWNER CAR WITH A FULL LAND ROVER SERVICE HISTORY WITH 7 SERVICES CARRIED OUT SO FAR! FINISHED IN RIMINI RED METALLIC ( RARE COLOUR ) WITH DARK CHARCOAL LEATHER TRIM. THIS IS THE V8 DIESEL WITH THE 8 SPEED GEAR BOX WITH THE SUN DIAL GEAR SELECTOR AND PADDLE SHIFT. LOVELY SPEC CAR WITH DEPLOYABLE SIDE STEPS, REAR VIEW CAMERA, DIGITAL TV, DAB RADIO, PARK HEATER WITH REMOTE CONTROL, ELECTRIC GLASS SUNROOF, HEATED FRONT AND REAR SEATS, ELECTRIC SEATS, CLIMATE CONTROL, CD MULTI CHANGER ETC ETC. THIS CAR IS A CRACKING EXAMPLE WITH TWO KEYS, FULL BOOK PACK, FULL MAIN DEALER SERVICE HISTORY ETC. Large and powerful, the Range Rover sets the standard when it comes to refined 4x4 vehicles. The model's distinctive silhouette and bold contours will turn heads everywhere, while inside the cabin driver and passengers are treated to a refined and beautifully appointed interior. Spacious and versatile, the Range Rover comes exceptionally well equipped. 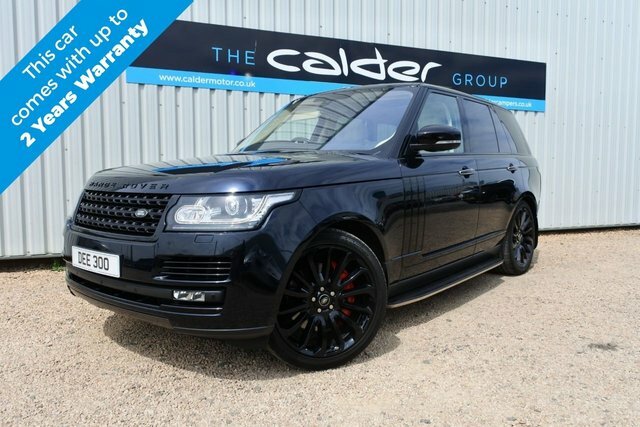 Come and discover one of our quality used Range Rover models for sale in West Lothian today. At Calder Motor Co Ltd you can rest assured you'll only find the highest quality second-hand vehicles, all of which are rigorously tested prior to arriving on our forecourt. View the latest stock online and be sure to contact a member of the team with any questions.